At least 200 families are thought to have lost their homes after a fire swept through a shanty town in the west of the Brazilian city of Sao Paulo. 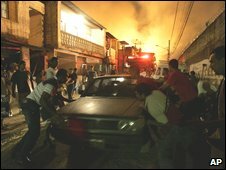 Images from the scene showed virtually the entire district of Diogo Pires engulfed in flames. The blaze took about three hours to bring under control. Local fire officials say only 5% of an area of 2,000 sq m (21,500 sq feet) was unaffected by the fire and some people were treated for smoke inhalation. The mayor of Sao Paulo, who visited the scene, has promised that those affected will be provided with temporary accommodation by the city. 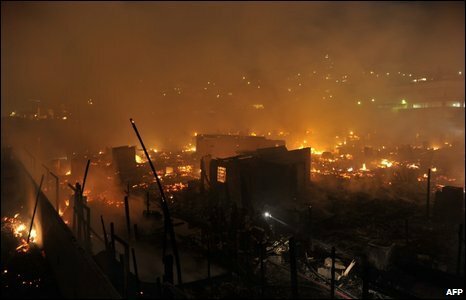 This fire spread rapidly among the poorly constructed shacks in the favela (shanty town) of Diogo Pires - many of them made with wood and cardboard. It is reported to have taken 26 fire engines at least three hours to bring the blaze under control. There were scenes of panic as residents fled with what little belongings they had time to save. Television images from the scene showed virtually the entire shanty town engulfed in flames. It had been home to around 1,500 people, many of them children. Three hundred other families had only recently been moved from the area into public housing. Mayor Gilberto Kassab went to the scene shortly afterwards and promised that the city would provide temporary shelters for the homeless. Many local people said they feared they would have to spend the night on the street. The cause of the fire is still not clear, but it was yet another indication of the precarious conditions for those in live in sprawling shanty towns found in Brazil's largest cities. This district has been affected by fires at least three times in recent years, as well as by landslides caused by heavy rains.